Hello everyone ! I've been playing around with Flexbox for a while. This week-end, I decided to see how it would work in an email, so I've run a few tests. I've posted an article about using flexbox in an email on my blog (in french). Here is an english translation for you email geeks. Not every webmails or mail applications support media queries. In order to adapt an email layout from mobile to desktop, it is important to find technical solutions that don't rely on its use. And luckily, the CSS Flexible Box Layout Module (Flexbox) allows exactly that. Flexbox is, theoratically, the perfect contender to build complex layouts from mobile to desktop without media queries. I've made a few tests to see it it was also the case in practice. If you're not familiar with Flexbox, I invite you to check out this complete guide to Flexbox at CSS-Tricks or play around on this Flexbox playground. Here is an example of an images' grid I used to make my tests. Some webmails (like Gmail or Outlook.com on mobile) don't support <style> tags, so it's usually better to apply styles directly inline on each tag with the style attribute. There are tons of tools to do this automatically. And this is where I hit a first difficulty to test. Absolutely every inliners I tried didn't care about these multiple declarations of the display property, and would only keep the last one. This is the case with Premailer, but also with Mailchimp, Putsmail, Campaign Monitor or even Zurb's premailer. Here's a final version of my test email with inlined styles (adjusted by hand). The flexbox layout then doesn't apply any more on the <a> tags, but on the <span> tags. This problem can be solved by applying the flex property to any other tag than an <a>. But this highlights a potential important problem : the slightest HTML modification done by a webmail can have huge undesired secondary effects when using Flexbox. Yahoo simply and purely filters any properties related to Flexbox listed above, even the property display:flex. Gmail and Outlook.com also filter every properties related to Flexbox, except the property display:flex. And in my example, this causes a huge problem because the Flexbox layout is still applied, but with its default values. Thus, without flex-wrap, the wrapping of images no longer happen, and the layout is totally desastrous. 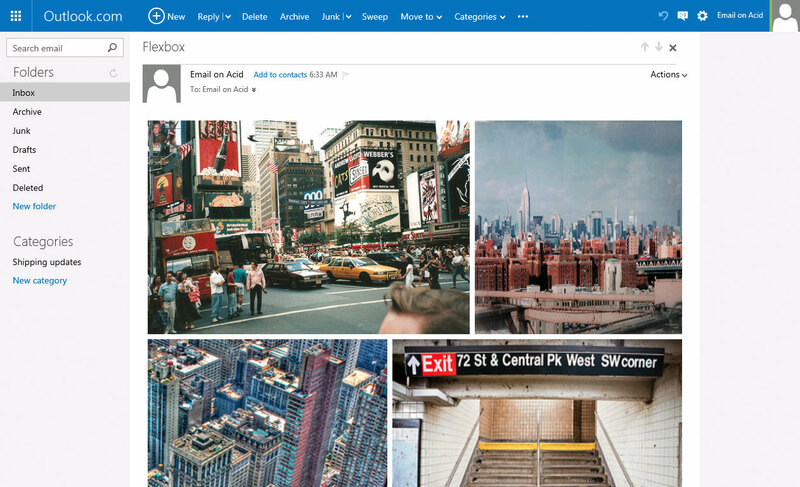 Here's an example of the render in Outlook.com in Firefox. But Outlook.com has another specificity. It filters every properties related to Flexbox except those using the -ms- prefix. Flexbox will then work perfectly in Outlook.com, but only in Internet Explorer 10 or 11. Here's an example of the render of the same email in Outlook.com in IE11. Nice one Rémi, good work. I was a little worried about it @supports rendering in Yahoo since their @media support update, I though it might render the code regardless of if it 'supports' the feature or not, but from my testing it looks to be not rendering either way. iOS 9 and 10 support @supports. Make sure your ESP is not stripping it, or feel free to share your code so we can help you. Here's my code. .flex is a div. And the children are table elements. I'm using MailChimp as my ESP.